Where stitching speed and quality is everything, SWF holds the fastest machines in the world. 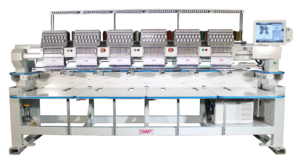 Stitching at 1,200spm, the newly designed KS Tubular Series of embroidery machines not only provide superior productivity and improved embroidery quality, they are also competitively priced. SWF has been responsible for several major breakthroughs throughout its 40-year history, including world patented Dual-Function technology, the Tubular and Dual-Function DM-Series stitching at 1,500spm, the DM 56 head stitching at 1,300spm and now the latest edition to the range – the newly released SWF KS-Series, capable of stitching at 1,200spm as standard! Featuring a wider 15.1in touch screen to make it easier for the user to see and operate, the machines uses LED work lamps which reduce power consumption and extend lamp life. The movable pressor foot only travels up to 5mm to increase the stitch quality and reduce flagging, which in turn can also be adjusted electronically from the 15in touch screen, dependent on the product being stitched, and is electronically engaged and disengaged compared to the normal machines where the pressor feet travel 27mm and are full controlled by mechanical devices. Due to a new advanced design mechanism, the machines allow for accurate positioning and increased colour change speed. The automatic pump action lubrication system reduces oil times to 10 seconds, and these models come with Laser trace and Hoop limits and Universal thread pick-up system, which requires no individual head motors. Moreover, design storage is increased up to 400 rooms and up to two million stitches per logo, with a total stitch memory of up to 40 million stitches. Offering a reduction in noise, vibration and power consumption, this range of embroidery machines is an unbeatable buy for those requiring serious production at a reasonable price. 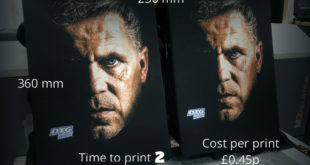 For more information visit www.yesltd.co.uk, call 01623 863343 or email hello@yesltd.co.uk.